Do you have thyroid disease, or have you had your gallbladder removed? Do you have issues with IBS or Colitis? Do you have unexplained itching or redness on your skin? Well, my children and I have had some of these same problems and it's really annoying and frustrating when you see multiple doctors and they all have some kind of pill or cream to give you that doesn't ever really work. Or worse, they tell you that they don't know what it is or they refer you to another specialist. I have 4 beautiful children that range in age from 23 on down to age 11. 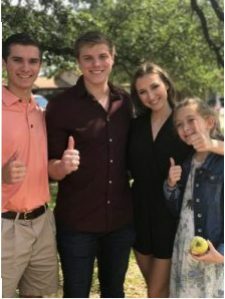 My oldest son just graduated from college at Texas A&M University, I have a daughter at Blinn Junior College, a son in high school and a daughter beginning junior high school. I have been an elementary teacher for over 20 years and I have a Master's in School Counseling degree. I started my journey as a health coach after watching my mother battle a horrible autoimmune disease and end up with cancer. Autoimmune diseases run in my family and I did not want to see one more family member suffer. I found out that we can put many autoimmune diseases in remission or avoid them completely by simply changing our diets. It made me angry that out of the many doctors I had seen, not one of them mentioned changing my diet. They all offered a pill to take or surgery, and one even suggested that my problems were probably just stress. I agree that stress may play a part as well as lack of exercise, therefore I've chosen a transformational whole body approach to healing and I can show you how! Starting An Exercise Routine Is So Hard! 7 Ways To Make It Easier.